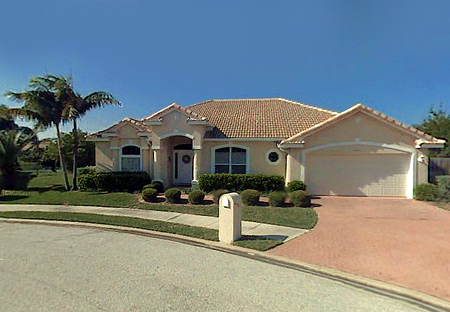 Ocean Ridge is a small gated community of newer homes and features deeded beach access and a fishing pier. 1.6 miles north of Driftwood Plaza (Publix). Ocean Ridge of Melbourne Beach is located in the upper south beaches. 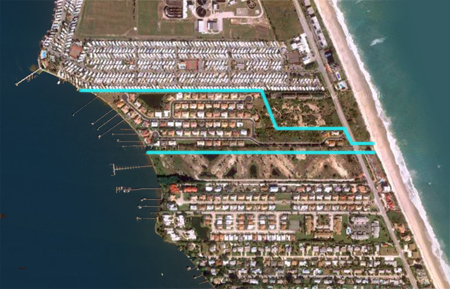 Enter community from Highway A1A via gated Ocean Ridge Drive. 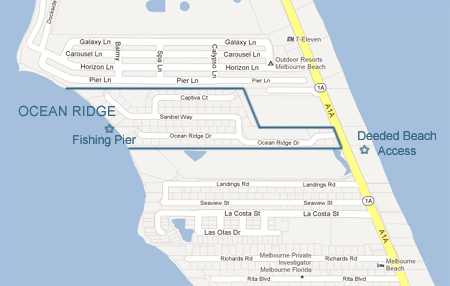 Ocean Ridge of Melbourne Beach is located in the 2900 block of Highway A1A – an area in the south beaches close to town, between Spessard Holland Golf Course and Driftwood Plaza (Publix). Enter via gated Ocean Ridge Drive. Info: Deed restricted single family homes on smaller lots for easy maintenance. Security gate and landscaped entry lead to cul de sac streets with sidewalks. Beautifully maintained community with deeded beach access and community fishing pier. Low maintenance fees. Beaches: Ocean Ridge features a deeded beach access just to the south of the entrance gate. Home styles – Built between 1996 to 2003. 1 and 2 story homes, 2 car garages, tile roofs.